Terry McPhillips has pleaded for a home draw in the second round of the FA Cup for his exhausted Blackpool side. 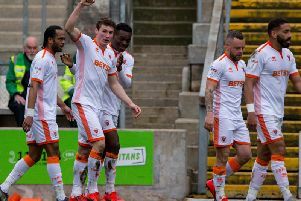 The Seasiders, fresh from their 570-mile round trip to Gillingham on Tuesday, made another mammoth trip down to Devon on Saturday to take on Exeter City in the first round of the competition. But as with the midweek league fixture, it proved a worthwhile journey as Pool came away with a 3-2 win. The draw for the second round will be televised on BBC Two from 7pm tonight and Blackpool manager McPhillips has made it clear what he wants. “I just hope we get a home draw because we’ve done some travelling and we’re sick of it if we’re being honest,” he said. “It’s one of them where you just have to get through and see what happens. “Hopefully we get a home draw because it’s another long trip on Saturday to Southend. But it’s football and you have to play the cards you’re dealt. “I’m ever so pleased for the lads to get on track with two away wins on the trot. I’m delighted. The Seasiders appeared to be coasting into the second round after racing into a three-goal lead after just 24 minutes, with Joe Dodoo, Mark Cullen and Harry Pritchard finding the net. But League Two Exeter fought back in the second half, reducing the arrears with 20 minutes to go. The Grecians added a second in the final minute of normal time to set up a nervy four minutes of stoppage time for Blackpool. But the visitors held on for a win which the McPhillips attributed to that superb first- half display. “It was good. We were clinical,” he said. “I don’t think we were three goals better than them but we were clinical with our chances. “It was a good, professional first half but the second half was always going to be difficult. “It’s a case of whoever gets the next goal and it was them. The first of Exeter’s two goals came after Ryan McLaughlin conceded a penalty, although Christoffer Mafoumbi did save Pierce Sweeney’s spot-kick before Jordan Tillson tapped home the rebound. McPhillips said of the penalty award: “Watching it back, it looks like Ryan has just caught him, so I’ve got no complaints. “The goalie has saved it, so it would have been nice if one of our lads had got there first but from what I’ve seen I’ve no complaints.